Ham Radio Growing In The Age Of Twitter Despite Facebook, Twitter, iPhones and other cutting-edge communication technologies, an increasing number of people are staying in touch using century-old amateur radio. "It's just talking and sharing and enjoying," says ham radio newcomer Helen Schlarman, 89. Stanley Hardman, an amateur radio operator, and his family look at transmitting equipment in 1939. 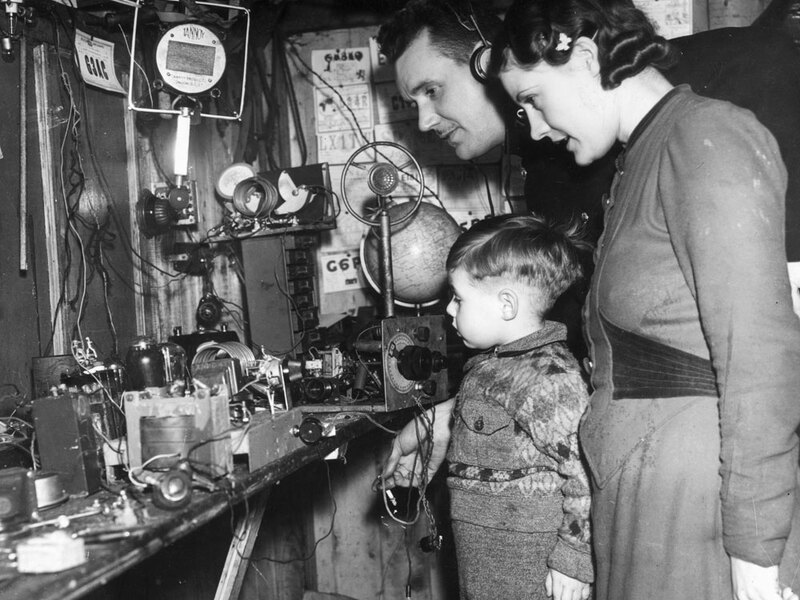 Nearly 700,000 Americans have ham radio licenses — up 60 percent from 1981, a generation ago. And the number is growing. "If it creates its own experience, that's really what's key here," he says. "If it just emulates an experience that you can get online, it's not going to grow." Newcomers to ham radio include Helen Schlarman, 89, who has a compact, two-way radio in her home in suburban St. Louis. She looks up a friend across town by pushing the talk button, announcing the letters and numbers of his call sign (W-0-S-J-S), and then announcing her own (W-0-A-K-I). Steve Schmitz's voice crackles through Schlarman's radio. "Hi Helen, how you doing, W-0-S-J-S?" he says, ending his response with his own call letters. Many "hams," as they're known, hang postcards from global contacts on their walls, the way hunters show off deer antlers, but Schlarman's chats are mostly local. She says this hobby is perfect for an outgoing person who spends a lot of time inside. "It's a different community," she says. "There [are] no stereotypes of age; it's just talking and sharing and enjoying." Until recently, ham radio was declining as older operators died. Then the Federal Communications Commission phased out the Morse code test that many saw as a stumbling block to getting a license. Last year more than 30,000 new applicants signed up to become ham radio operators, according to Maria Somma, an official with the American Radio Relay League. At a ham radio convention near St. Louis, the crowd swapping antenna parts and other equipment is mostly male, and over 50. But 15-year-old Jonathan Dunn is attending along with his father. He says Facebook and texting are fun, but making friends using a $200 radio that doesn't come with monthly fees is more rewarding. "With ham radio you can talk to new people, all kinds of ages, races, and it's just amazing what a little radio can do. Because no matter where you're at, if you have the right stuff and the right power you can talk to anyone," he says. Jonathan's dad, Steve Dunn, says the polite chitchat between ham radio operators is good for teenagers. "If young people have the opportunity to communicate with a wide range of people, that instills a certain amount of confidence in their ability to carry on the lost art of small talk," he says. Even the most die-hard hams concede that amateur radio will never be a mainstream hobby. With smart phones and other devices, people are more plugged in to the Internet than before. But people are still discovering the joy of communicating with a technology that's existed for nearly a century.